Excess weight is a problem for many individuals, and is a growing issue in the Western world, mainly due to an increasingly unhealthy diet. Being overweight is unhealthy and can increase the risk of developing many illnesses, such as cardiovascular disease and type 2 diabetes. For this reason, it is important to take steps to lose excess pounds and keep a healthy weight. 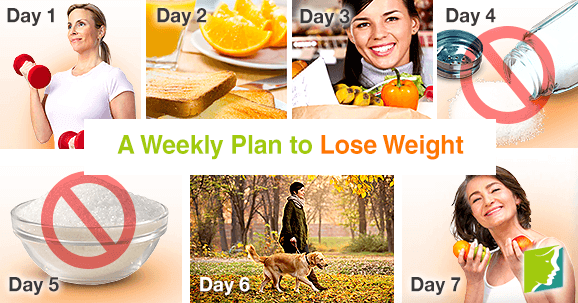 Read on for a weekly plan to lose weight. The main thing to bear in mind when trying to lose weight is to simply burn off more calories than are consumed. For people with excess weight, this often means eating less and exercising more. What you eat is important to an extent, but more effort should be focused on the amount you eat. It is also important to avoid crash diets, which deprive you of certain foods. These can often work in the short term, but are not sustainable and will also deprive your body of the nutrients it needs, often causing other problems. The plan below is an easy way to get started with your weight loss program. Start by choosing an exercise class that you will commit to weekly. This will give your weight loss plan some structure and keep you motivated. It is important to choose an exercise you will really enjoy doing so that exercising does not become a chore. Shop for food, but avoid any junk or packaged things. The first step to not snacking on high-calorie foods is to avoid temptation. By not having junk food in the house, you will not eat it so often. When buying snacks, opt for things like colorful fruits, low-fat yogurt, and hummus with vegetable sticks. Start being conscious of the amount of salt you eat. This includes reading food packets and opting for the foods with lower salt, as well as to stop using it in cooking. Salt is one of the prime causes of bloating, so it will only increase weight and decrease motivation. Start gradually reducing the amount of sugar you eat. This might include buying low-sugar foods, avoiding dessert, and not adding any sugar to teas and coffees. It is best to do this gradually, so it might take a few weeks before you get to the point at which you wish to be. Go for a 30 minute walk or bike ride. 30 minutes of exercise a day is normally recommended for overall health, so begin by doing this a few times a week and gradually increase it until you are exercising each day as a matter of course. Personal exercise regimens will complement the weekly exercise class you have committed to. Think about how your week has gone - what has been successful and what has not? Try to think about changes and improvements you can make next week. Weight loss should not be rapid, but rather, it should be a result of incremental and sustainable changes. It might be frustrating not to see the weight fall off in a day, but by making small lifestyle changes and gradually increasing them until they become habit is the healthiest way to lose weight, and is far more likely to last long-term.